"My God, of COURSE I can read." I also enjoy Gunter Grass novels. Like “Katz and Maus,” and “Dog Years.” I found “The Tin Drum,” very disturbing though. So I ate it. I think I may have also eaten a book by Herman Ebbinghaus, but I can’t recall for sure. What? Did you think I read only the backs of dog food packaging? Or Jack London novels? 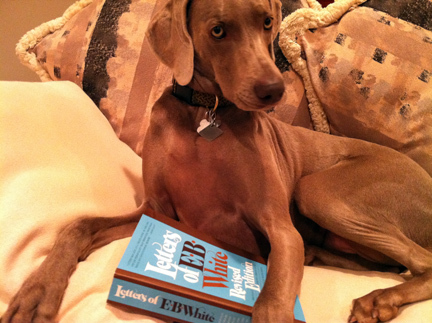 Please, I’m a weimaraner, not some common canine. I can even write. What the hell do you think you’re reading right now? I have no ghost writer. I AM the ghost writer of this blog.